Department of Trade and Industry (DTI) Secretary Ramon Lopez (right) and Mitsubishi Motors Philippines Corporation (MMPC) President and CEO Mutsuhiro Oshikiri (left) unveiled an electric vehicle (EV) quick charging station at the Board of Investments (BOI) compound in Makati City on 21 May 2018. 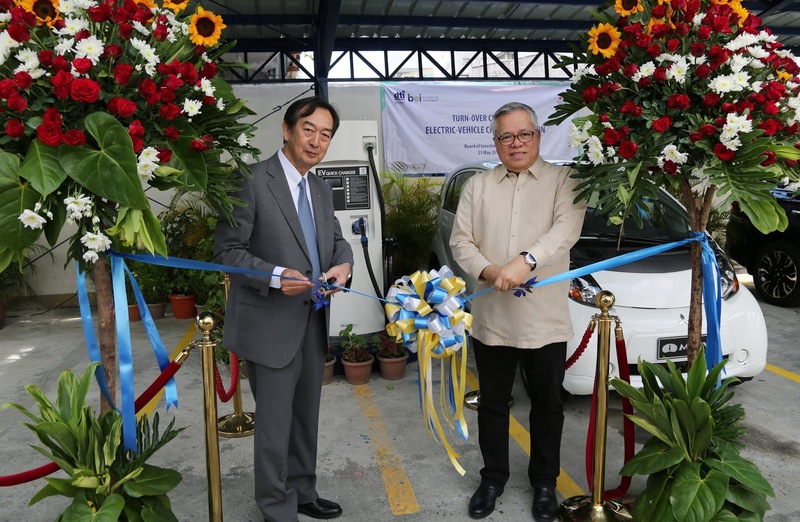 In line with the government’s push to create an EV ecosystem in the Philippines, MMPC donated the quick charging facility to DTI to complement their two Mitsubishi EVs, the I-Miev and the Outlander. This is part of the EV Research Study initiative being done by DTI-BOI, MMPC, and a consortium of universities composed of De La Salle University, University of the Philippines, Technological University of the Philippines, Mapua University, and Ateneo de Manila University. “We know that the future automobile is going to be transformed and driven by forces such as autonomous drive, electrification, diverse mobility, and connectivity. The cars of the future are going to be greener, electric, connected, and autonomous,” said Sec. Lopez. The results of the EV Research Study will serve as important inputs for the formulation of EV policies and programs. These cover environment, transportation, energy, and industrial policies necessary for environmental protection and the development of the EV industry.